My husband and I have been lucky with the stray and rescue dogs who have joined our pack in the past 20+ years. They all came with their own personal mystery baggage, which manifested as behavior problems, but none were so awful that we had to un-adopt or relinquish them. In fact, each of them set high standards for any future strays or rescues. Teddy, who joined us in April met those standards with ease, as he is pack-friendly and makes us laugh with his comical exuberance. But recently a certain little someone raised the standards. After Henry passed away, and before Teddy came into our lives, I’d made a few inquiries on Petfinder.com, but nobody ever responded, which surprised and disappointed me. Then a friend introduced us to Teddy and I figured I no longer needed any dog adoption websites. A couple of weeks later, when my heart was still aching for a little dog like Henry, I started another search. I was skeptical about using Petfinder so I went directly to some local shelters. Sadly, my efforts were fruitless, so I swallowed my skepticism and logged onto Petfinder. After selecting some filters: adult, female, Chihuahua mix, good with other dogs, I pushed “search.” The first face to come onto the screen was Goldie, a “6-year-old, 8-pound fawn Chihuahua – good with other dogs.” Instead of going to the trouble of filling out an application, I chose the option of just asking a question about her, “Does Goldie like to be held?” I knew I wanted an affectionate dog, so I might as well find out. In less than 24 hours I got an email from a woman named Stephanie, Goldie’s foster mom, saying, “Yes, she likes to be held. What exactly are you looking for in a dog?” I responded immediately, saying we’d always been a 3-dog pack, but had lost 2 in the past year, and were hoping to adopt a little female to love. I assured her that all our dogs get smothered with love and go on lots of walks. “OMG, yes, Goldie is perfect. She’s very loyal and sweet. She’s here and needs a home. Please let me know if you want to set up a meet and greet,” she replied minutes later. We exchanged a few more friendly emails and set a time for her to come to our house. Two days later, I put Cassie and Teddy in the back yard, so Goldie wouldn’t get overwhelmed, then nervously tidied up the house as I waited for Stephanie. Although I was anxious I had a good feeling about Goldie. Her photo and brief description on Petfinder didn’t tell me much, but the energy and tone of Stephanie’s emails gave me hope. Soon after her car appeared in our driveway her door opened and two leashless dogs jumped out and ran toward me. One of them was Goldie, the other was a little gray mop Stephanie called “Junior.” “He likes to come on all our meet and greets.” We all went into the house and sat in the kitchen. I couldn’t take my eyes off Goldie. She was Henry’s size, maybe a little chubbier, and walked just like him. She and Junior explored the living room, sniffing every corner, then she lifted her leg and peed on the corner of Don’s recliner chair. “I thought Goldie was a girl.” I said trying to get a look at her belly. “She is, but she’s a tomboy.” Stephanie assured me. This made me smile because when I was a kid I was a tomboy and I tried to pee like my brothers. After Goldie sniffed and peed, she suddenly got shy and hid behind Stephanie’s legs. Stephanie picked her up and she melted into her arms. “Yes! Please!” I held out my arms and she came right to me. She even nestled herself into my chest as she had with Stephanie. That was reassuring. I could sense that the two of them had a strong bond, and I would need to provide adequate love to earn her trust. She felt like a baby, snuggling her fawn little body against mine. I was smitten. After 5 minutes of cuddling, I handed her back to Stephanie and let Cassie and Teddy inside so they could all meet. They came bounding in to check out both Goldie and Junior. There was no growling or snapping, so Stephanie put Goldie on the floor. The sniffing continued, and still no conflict. Junior seemed to delight in the company of the big dogs, but Goldie ran back behind Stephanie’s legs. At that point Teddy and Cassie lost interest and wandered away. No squabbles – so far, so good. Stephanie said I could keep her and see how things went for a few days, with the understanding that I could return her if it didn’t work out. I wrote a check as a donation for her rescue organization and she and Junior left. Goldie went to the back door and stared at it, like she was waiting for her “mom” to come back. I felt bad but was determined to win her love and fill Stephanie’s shoes. Their bond was strong because they’d been together for more than a year. 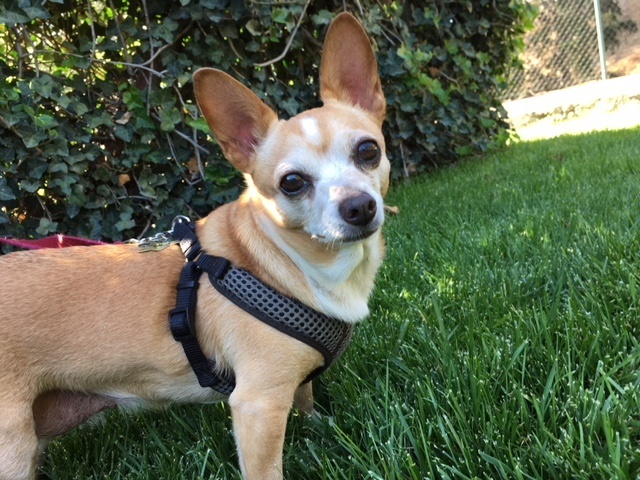 Goldie appeared as a stray at the Palmdale Animal Shelter in April of 2017, very thin and suffering with a large inguinal hernia, which required a major surgery. Stephanie’s rescue organization must have paid for it, but the medical records I received didn’t indicate who footed the bill. Little Goldie had been through a lot in the past year so her attachment to Stephanie was understandable. The day Goldie came to live with us was the day after my birthday and I considered her to be the best present ever. She was quite shy and didn’t eat much in the first few days but was very open to being held and petted. She hid under the kitchen table or stayed curled up on the couch and I worried that she was older than we thought, but when we started taking her on walks, she perked up. After a few days she was very peppy and now she follows me everywhere. On her second day I took her with me to the animal hospital where I volunteer in the office, just as I did with Henry, and she insisted on sitting in the same chair with me. It was a little awkward and I feared I would elbow her in the face as I typed, but in time we’ll work it out. After about 5 days she stopped staring at the back door, so I’m hoping she doesn’t miss Stephanie so much anymore. Now she looks at the back door because it means we might be going for a walk or for a car ride, which she loves, just like Henry did. Goldie and I have a special bond and I’m so grateful she trusts me. We’re still working on her trust of Don. On two occasions she snapped at him as he was trying to give her snacks on the couch. I don’t know what that’s about, but I remind myself that it’s only been 10 days since she’s joined us. She has no problem with Don carrying her or petting her the rest of the time, so we hope it’s a temporary quirk. She’s been through a lot in her 7+ years. Who knows what her life was like before she got to the shelter in 2017? She only weighted 8 lbs at that time, which is pretty skinny for a dog who should weigh 10 -11 lbs. Will I get her trained as a service dog? Good question. She’s got the right temperament and we’ve already bonded in a special way that seems necessary for service work, but we’ll see. Training Henry took 6 months of lessons and a lot practice hours, and he was much younger than Goldie is now, but who knows? When I came across Henry’s little uniforms shortly after he passed, I burst into tears and stashed them into a corner, but I got them out recently and laundered them, thinking Goldie may someday be qualified to wear them. Whatever we decide to do she will be a treasured companion for as long as possible. This took so long to read as the tears were blurring my vision. I am so happy that you and little Goldie have found each other. I look forward to hearing lots of stories about your new pack. Thank you Sheila. Little Goldie is a delight. She knows how to comfort me the way Henry did, even though she has no training and has only been with us 10 days. She gets loads of attention from me, but Teddy and Cassie are still getting plenty from both Don and me, so there are no hurt feelings.. Thank you Carol. I just love her! Of course. I gave her the middle name Marie after her Aunt Colleen! She says she loves you already. Wow, congratulations to you AND Goldie for finding each other…a perfect match! 💞Beautiful post, love the photos! God bless you Martha! Thank you! She’s truly a gift from heaven. I just have to remember that she’s 7 years old so her time with us will be especially dear. How wonderful for ALL of you, Marthamydear! She’s smiling in the one photo, lying in your arms! She’ll fall in love with Don…rescues always come with ”ghosts,” don’t they? And, by the way…YOUR smile in that photo will make all who see it smile right back! Thanks Pam. Yes, I’m sure she has ghosts. She”s not a big eater, which we haven’t seen in many of our previous dogs except when ill, so that is causing me some concern. She’s a little chubby so I’m thinking she just needs more time to settle in. Walks help. The problem with little dogs is…even two extra kibbles can add weight! You’ll do it. She didn’t eat much her first day, then started eating a lot, which was reassuring. But for the past day or so she’s lost interest again. I know it’s very stressful to move into a new home, especially after having such a great foster mom for a year. She gets lots of walks, so we’ll continue those, but It’s hard for me to not worry…sigh. What a blessed dog is Goldie. What a blessed lady is Martha. Thank you Ann. We got so lucky with Teddy and Goldie. She and I are very attached to each other, which may make Don feel neglected, but I think he understands how much she’s doing for me. So sorry I missed this post when you published it. I’ve been wondering about Teddy and what you decided to do about a new service dog. Hopefully I’m a few years behind you on that journey, but I can’t imagine replacing Gizmo. I’ve loved all my pets, but the bond with a service dog is a completely different relationship. Thank you for sharing your experiences. I hope all is going well with your health and your pack. Thanks Kathryn. We’re all pretty well. Goldie is sooo loving and has attached herself to me like an appendage. I take her many of the places I took Henry, but she’s not trained. She’s just so well behaved that people who know me let her come in. It’s sweet. My husband started a new job recently, which is really stressing him out. He now works at home so I get to hear and see his angst and frustration. It makes me and Goldie nervous, and it has made it harder for her to connect with him, but little by little she’s learning to trust him. It’s weird because I’ve been with Don for 23 years and have never seen this volatile side of him. I’m trying to be loving and supportive, but he’s lost his temper with Goldie a few times and I take it very personally. I just keep praying for him to find peace, He’s an intimidating person and I’m very fearful and reserved so it’s hard for me to share my feelings with him. Talking about the dogs is always neutral territory so I stick to that. Thanks! I hope all goes well for Steve. What city will you be moving to?